STRONG pedigree and commercial interest resulted in a good trade of Charolais bulls at Welshpool. STRONG pedigree and commercial interest resulted in a good trade of Charolais bulls at Welshpool. 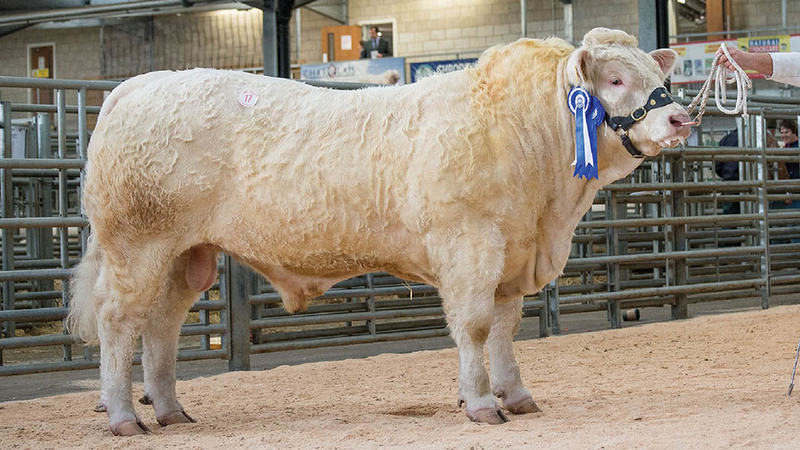 Bidding hit 7,200gns, with the entry of 43 bulls averaging £4,444.19, up £588 on the year. Sale topper was the reserve champion, March 2016-born Cliftonpark Madoc, from J.M. Robinson, Tenbury Wells. By the French-bred Rosanna Fameux and out of the homebred dam Cliftonpark Irish, it commanded a bid from P. and M. Davies, Powys. Following at 7,000gns was Kevin Thomas, Dyfed, with the 18-month-old Moelfre Maestro. The first son by the 12,500gns Balmyle Impression to be offered for sale, it is out of Moelfre Dollar and sold to E. Jones, Gwynedd. Gareth Jones, Bala, took 6,800gns for April 2016-born Esgob Magnumgold, a Alwent Goldbar-son which won its class in the pre-sale show. Out of the former Royal Welsh Show junior champion Esgob Gold, it sold to J. Roberts, Bala. Females averaged £2,826.25, hitting 4,000gns for the female champion Graiggoch Lucy from Gerwyn Jones, Nebo. A daughter of the 16,000gns Stirling junior champion Clyth Diplomat and out of the 25,000gns Mowbraypark Orlando daughter, Thrunton Starband, it went home with Kevin Thomas. 43 bulls, £4,444.19; 6 heifers, £2,826.25.